Yet another example of a narrative being offered that looks quite convincing until you dig deeper into it. Oreskes insists that she never intended to become a “climate-change warrior.” In 2004, when she was researching how scientific consensus and dissent emerge, she published “The Scientific Consensus on Climate Change,” a review of the scientific literature that made clear the widespread agreement among scientists that climate change is real and created by humans. 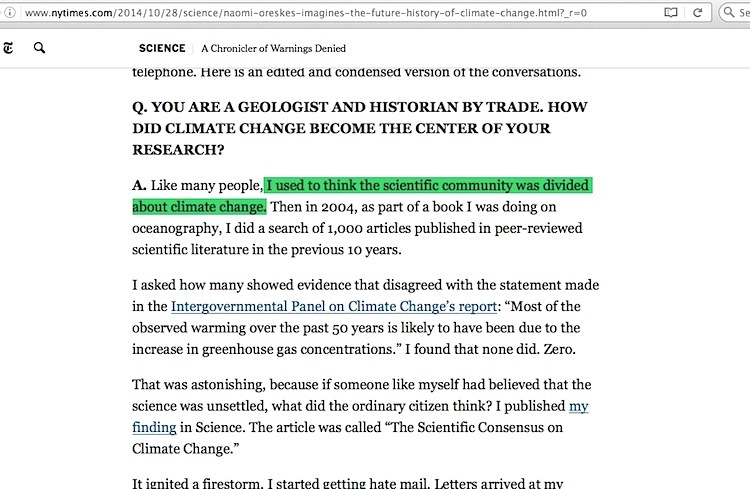 One journalist, she remembers, thanked her for the article; every time he wrote about climate change, he told her, readers accused him of bias for not covering the contrarian side, and her paper helped him show that there was no legitimate contrarian side. Regarding the words above in boldface, I rebutted those in a comment I left at the article’s comment section. In a nutshell, the ‘fossil fuel industry-funded deniers’ she speaks of were fully understood back in 2004 by Ross Gelbspan and the legions of people repeating his accusation about that. Worse for Oreskes, the angle she took in her “Merchants of Doubt” book about people such as atmospheric physicist Dr S Fred Singer being swayed by political beliefs was hinted at by Gelbspan as far back as the time when he was still employed as a reporter for the Boston Globe in 1992. 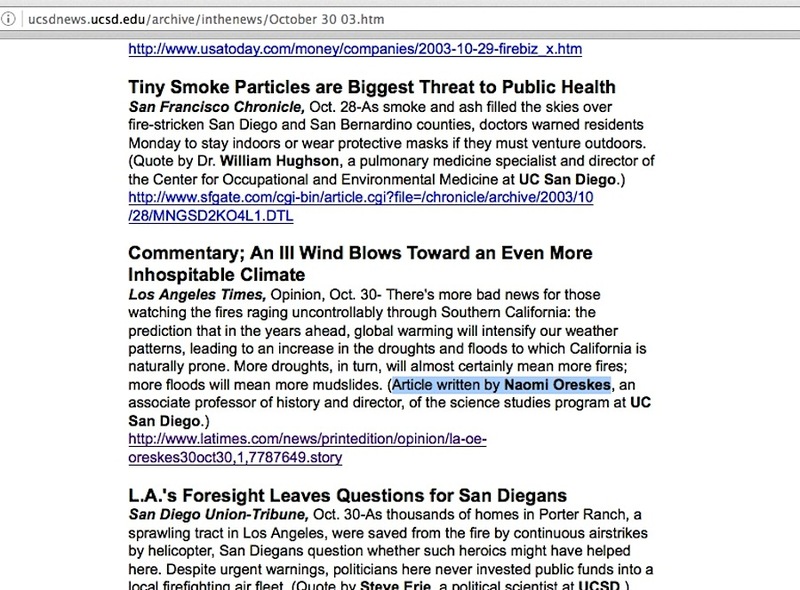 Regarding the journalist Oreskes mentions who felt relieved about not having to give fair balance to skeptic scientists, that might be worthy of further investigation, in order to find out whether that individual was suffering from egregious confirmation bias while parroting a talking point long perfected by Gelbspan, or whether this is actually a genuine event, considering Oreskes’ story about the “Tulsa Register” reporter which I detailed here. But then there is the sentence I highlight above in red. 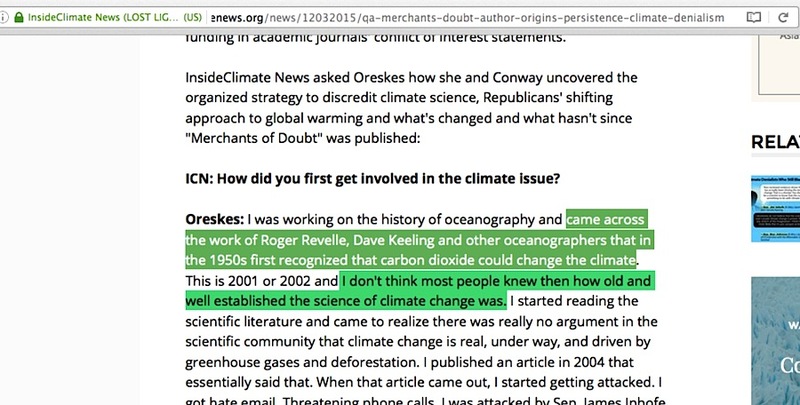 Examine Oreskes’ various narratives on what led her to look deeply into the motives of skeptic climate scientists, and the general impression is that she was minding her own business, focusing on the history of oceanography, albeit either knowing how scientists such as Roger Revelle contributed to the science being long settled on the issue (while failing to mention how Revelle’s recant of the conclusion was so hugely problematic), or thinking the science was divided on the matter, depending on which narrative you find. That particular conundrum notwithstanding, the general impression she gives is that it wasn’t until after the criticism came out in response to her 2004 paper on the ‘scientific consensus for man-caused global warming’ that she became a global warming activist. 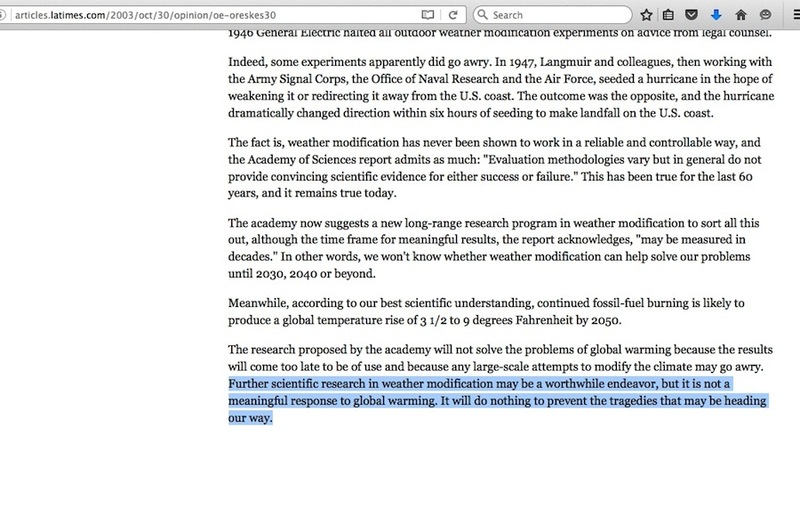 Further scientific research in weather modification may be a worthwhile endeavor, but it is not a meaningful response to global warming. It will do nothing to prevent the tragedies that may be heading our way. The appearance of an activist tone there is unmistakable. But there’s more. 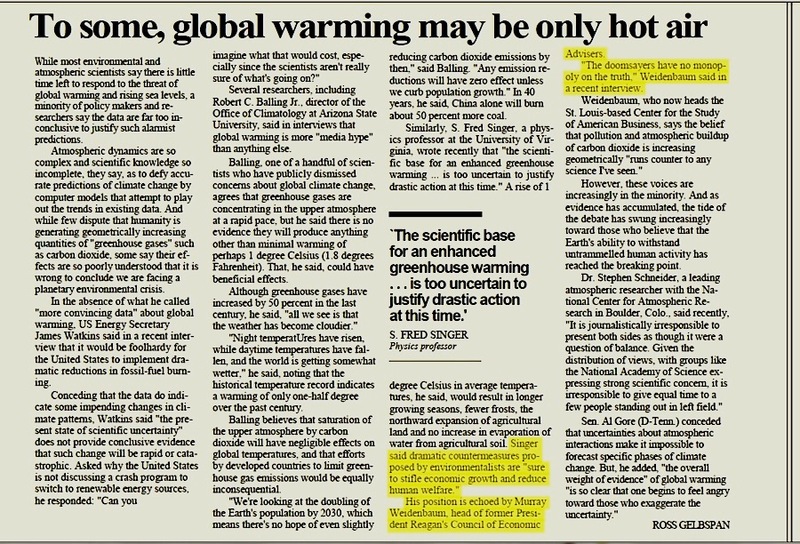 An April 2003 Rocky Mountain News article describes an American Association for the Advancement of Science presentation in Denver in which Oreskes offered three examples of how politics got in the way of solving a scientific problem, the last example being a means of definitively proving the existence of global warming. 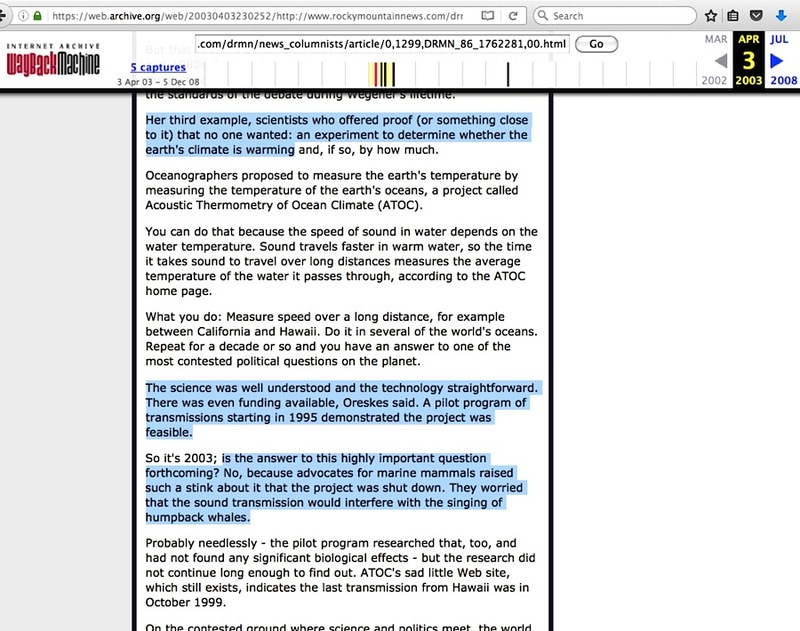 While not pushing an outright activist position in that case, it nonetheless indicates that Oreskes was already offering a public position on global warming well over a year before she claims she got sucked into the issue. The most elemental question arises about Oreskes from my three-blog post series: as a historian, why is she plagued with the appearance that she can’t tell an accurate tale of her own history? 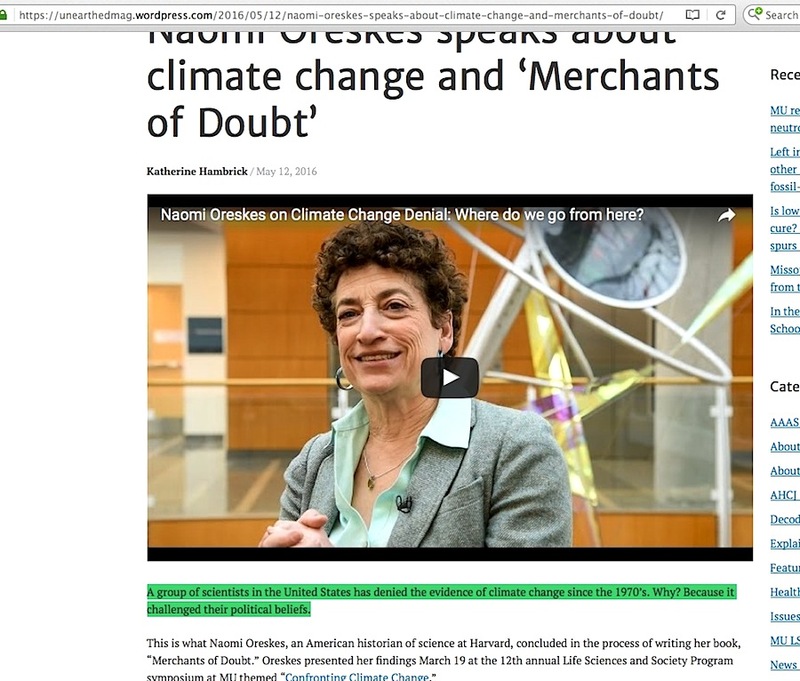 This entry was posted in Narrative derailment and tagged Naomi Oreskes by Russell Cook. Bookmark the permalink.